This month Jenn and I have been hosting a weekly link up on Fridays. We want you to take a challenge with us. We want to spread Christmas cheer and KINDNESS every where we go. 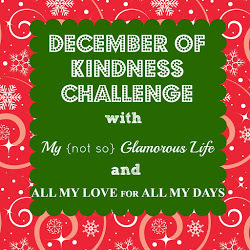 We hope that you will take this challenge with us especially this next week and then link up here or on Jenn's blog next Friday. This past week I've been working hard to purposely change my behaviors to be kinder. For example, I helped my mom with her family Christmas letter. I hate strongly dislike clerical work, but I had a few days off of work and my mom needed help so that's what I did. I also got the opportunity to help some of my friends wrap presents for a fundraiser they were doing. They are going to Ukraine next summer to run a summer camp for an orphanage I wish I could go, but I can't. I did the next best thing. I helped them wrap presents. We had a lot of fun doing it too. It's kinda fun secretly running around trying to find ways to surprise people with little blessings. We only have a few more days left in this Christmas season. While you're out finishing up your shopping work extra hard to show kindess. This season can be one of the most desperate, lonely times for people. Everyone wants to belong somewhere so when you don't belong anywhere it makes that desire seem so unreachable. Can I add one key thing to our challenge for this month? Let's try to go out of our way to reach out to the "unlovely" and "unloveable." You might find that these people are really just like you.